We all know that when it comes to Glock 26, the first words to come in mind when describing it are dependable and powerful. This gun is a subcompact polymer framed striker fired semi automatic handgun that is very popular as it’s so easy to carry. It’s a common choice not only for the law enforcement and security professionals, but also among the regular citizens as well. We’re pretty sure its popularity also comes from its ability to hit 12 rounds of hard 9mm ammon in its magazine. Therefore, it’s common sense that a tough gun like this would need a tough IWB holster that takes its great performances, no matter how and when you carry the gun. For some, the most important asset on a holster is concealment as it’s essential that the IWB keeps safe and secure, concealed, your Glock 26. There’s no good in carrying your G26 in town though, throughout the entire day, if you feel totally uncomfortable. So comfort is always a big thing on your IWB holster, no matter how great it may be on other levels. Even though this isn’t the most important quality on a holster, versatility plays a big part in this show also. The more adjustments you can make on your IWB holster, the more various are the situations when you can use it. either we talk about adjustable retention, cant or ride height, the more settings you get to make on your IWB holster, the better the holster is going to perform out in the field/city. Many of us would always pick a holster that offers easy draw and re-holstering. Sure enough, you need to take a step back and get a better idea on what counts the most to you. It’s not that easy to find an IWB holster that presents all these qualities and you kind of need to know it all comes with a price. The more you give, the more you get so be willing to pay the extra buck when you’re in with the whole nine yards. Going shopping with just a few bucks is no picnic, but you can definitely end up with a fairly good option with a holster like the DeSantis Glock 26/27 Insider Holster. The holster is made with black leather and even if it needs a couple of days until it fully breaks in, it’s totally worth the wait. The holster gets softer with each wear and gives a snug fit to your gun. 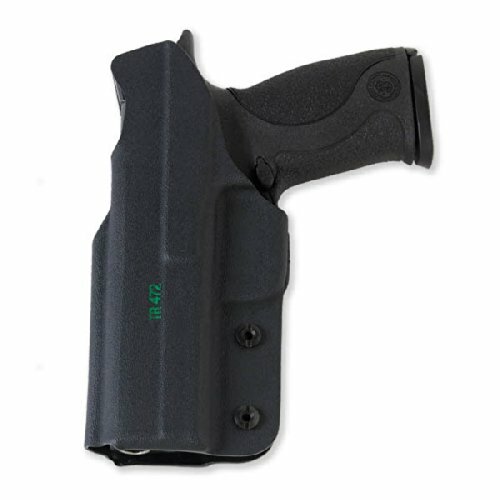 Looking at the features, we notice the good concealment of the holster and the comfort on the move. The minimal design eliminates risk for bulk and imprinting as well. The spring steel clip is placed high for deep cover and is very strong. The draw is smooth and the holster is easy to use. It rides low and the grip is rather long. The holster is well made and leaves a durability feel. The leather is soft and un-molded, but manages to give a great fit to your gun the longer you wear it. It’s comfortable to wear the holster throughout the entire day. For the money you pay, the holster is a good option that doesn’t let you down with its performances and built. Even though it’s made with leather, The Ultimate Suede Leather IWB Holster has a low profile which makes it so comfortable to wear all day long. The rugged construction and good built on the holster has a durability feel attached to it, which is always good to have. As most leather holsters, The Ultimate also needs a couple of days to break in and the more you wear it, the better it gets as the leather softens just right. We like the holster for its weight also as it’s not too lightweight, nor too heavy. The form-fitted design gives a snug fit for your gun and increases your comfort. The design makes the holster highly versatile as it fits various gun models from Glock and other ones too. You get easy access to your gun and concealment is quick and easy. The retention is reliable and the metal belt clip keeps the holster in place. The suede leather of the holster feels soft against your skin and doesn’t irritate your skin. The breathability is efficient and the holster feels kind of cool in the hot summer. The low profile and slim appearance minimize printing of the holster. Made in our USA, the holster surprises with the craftsmanship, reliability and comfort, considering its low price. All in all, for a low price, you get a comfortable, reliable, low profiled leather holster that holds up pretty good a long wear. If you are the proud owner of one of these Glock models: 26, 27 or 33, you can get some help from a good holster like the Galco Waistband Inside The Pant Holster. 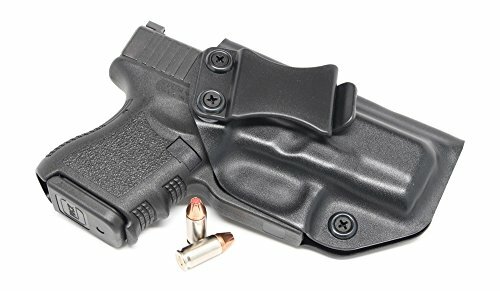 Galco IWB holsters are well known for the good quality they present for a very good price. This one makes no exception and is made with fine, soft leather and needs only a couple of days until it breaks in entirely. The list of good things includes also a metal finish on the thumb snap and plastic clip that is tough and looks pretty durable. The holster is quite versatile and fits a good range of belts, offering the best comfort every single time. We like the holster as it’s soft, flexible and comfortable in all sorts of carry positions. It’s functional with many bottoms and dependable. The re-holstering is easy to do and the hold is reliable thanks to the secure snap. The reinforced thumb break retention strap and the injection-molded nylon clip keeps the holster secure onto your belt. The holster carries your gun in vertical orientation so you may use it strong side, appendix carry or crossdraw. The retention is good and the holster is very well made. It’s used by citizens and law enforcement just as well, due to its built and reliability. Nevertheless, for a fair price, you get a dependable, flexible and well made holster that does an amazing job concealing your Glock 26. The smooth drawing and easy re-holstering of the Concealment Express IWB KYDEX Holster are some of its best qualities, but the holster brings a lot more on the table. The holster is made here at home in our USA with tough Kyxdex and it’s one of the most popular choices out there. Comfortable and with minimal printing, the holster really is a great option for many. The low profile and small print are also things to notice on the holster and the minimal design is very effective. Its adjustability is also something to talk about and you can make several setttings on the holster. You may set the retention, the cant (carry angle) from 0 to 15 degrees. the 1.5” belt clip is strong and dependable and the “Posi-Click” lets you hear when your gun is holstered. As for the sight channel and the retention, they are always reliable and functioning. The sweat shield protects your gun from corrosive perspiration and helps the holster not irritate your skin either. The holster doesn’t move around and its tension is just fine. If you’re a big guy, the holster may serve you well also as it doesn’t dig. For the low profile, efficiency and comfort, the holster still stands as a great choice for many. Made here at home in our USA, the FoxX Holsters Glock 26, 27, & 33 In The Waistband Hybrid Holster combines the toughness of Kydex and the elegant vibe of leather. The holster is made with both leather and Kydex but doesn’t need time to break in and it’s ready to wear right out of the box. the holster is comfortable and easy to conceal. It’s also tuck able, which is so great to have on an IWB holster. The adjustability of the holster is dependable and you may set both the ride height and the forward cant, according to your needs. The black spring steel belt clip is strong and keeps the holster secure on your belt. The holster’s design ensures a snug fit to your gun and lets it slide smoothly as well. Your gun is always ready and the drawing is fast and easy. The holster has nice finish and has a solid construction. It’s ready to take the intense use, for quite some time. The minor flaws aren’t deal breakers for us though and we still consider the holster to be a good choice when in need of a hybrid holster. 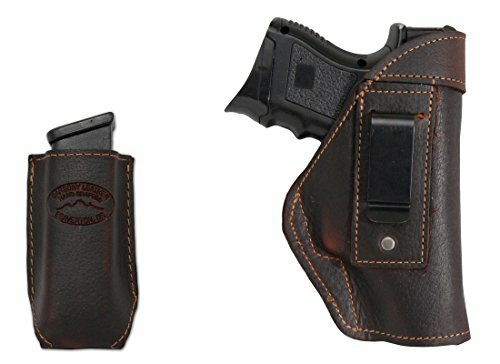 Soft and ready to wear right from the very beginning, even though it’s made of leather, the New Barsony Brown Leather IWB Holster is versatile and dependable and also comes with a helpful magazine pouch. 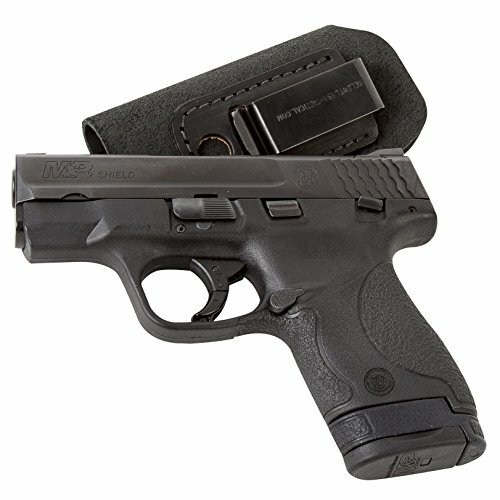 The pouch is for compact and sub compact 9mm 40, 45. The holster is made with good quality cowhide leather and the stitching is not not accurate, but also very well made, increasing the durability of the holster. The holster is lightweight and very easy to wear. We also like the versatility of the holster since you may wear it in various ways for better comfort. The concealment is reliable and good, no matter how you wear the holster. The pouch also looks nice and matches the durability of the holster. The holster secures well your gun and is very easy to use. It’s easy to draw and to adjust the holster. The holster fits belts up to 1 ¾” wide, which is great for many of us. Last, but not least, the holster is made here at home in our USA and impresses with its quality and craftmanship. For what it’s worth, we still think the holster is a fair option when in need to conceal your Glock 26. Either you are a regular civilian or an experienced law enforcement, the Galco Triton Kydex IWB Holster is a sure thing when it comes to IWB holster for your Glock 26. The holster is made with tough, maintenance-free Kydex so it’s not only long lasting, but also very easy to take care of. The craftsmanship fits the high quality of the materials and sustains the durability of the holster. All the tough material and rugged built don’t minimize comfort though as the holster has a rather low profile and it’s pretty thin. Great thing about Kydex holsters is that they are ready to wear right out of the box and it’s the same for the Triton that doesn’t need time to break in. 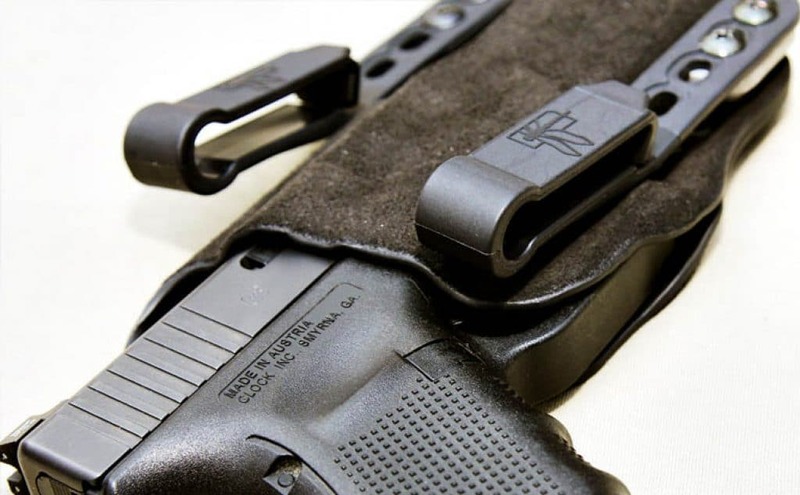 Kydex holsters also give a snug fit to your gun almost every single time and the Triton doesn’t make any exception. We like the good grip on the holster and the tension that is good. The holster is easy to conceal and the raised sweat guard protects the gun from corrosive perspiration, minimizing risk for irritating your skin at the same time. The draw is smooth and you don’t need to worry about the retention. The belt clip is tough and holds very well. It fits belts up to 13/4” and matches the rugged built of the holster. It’s easy to put on/take off the holster. The holster is ting, fast and presents good adjustability as well. The minor cons aren’t deal breakers for us and we consider the holster to be a good choice for any owner of a Glock 26. Made with genuine leather, the Glock 26/27/33 IWB Hybrid Holster is a good option when in need as it comes with so many good things and only few minor issues hold it back from being the best out there. The holster includes a long lasting leather face that is backed up by a polymer stiffening insert and a soft suede backing. The combination manages to have a low profile and the printing is minimal, with no show of the holster underneath your clothes. The holster becomes also a sweat proof guard between your gun and your body that presents nice flexibility as well. The comfort curve design creates a rounded profile for the holster and the fact it’s not flat as most out there helps with the comfort. The holster is ready to use right out of the box and doesn’t need time to break in. The construction of the holster is also a great asset. The long lasting Kevlar stitching joins the leather and Kydex for a very long time, no matter how much you use the holster. In terms of adjustability, the holster is quite good. You may set the retention, the ride height, the cant, exactly how you need it for a specific situations. The holster is designed for the 3 to 5 o’clock position by a right-handed shooter. The metal clips on the holster are strong and match the strong built of the holster. The holster is very well made and it’s dyed evenly, front and back. It doesn’t dig nor irritate your skin. No matter the minor issues, the holster is a durable, well-made hybrid holster that stands out with its low profile and reliability. The minimalistic design on the Tulster Profile Holster IWB Glock 26/27/28/33 Holster doesn’t lower its performances at all. 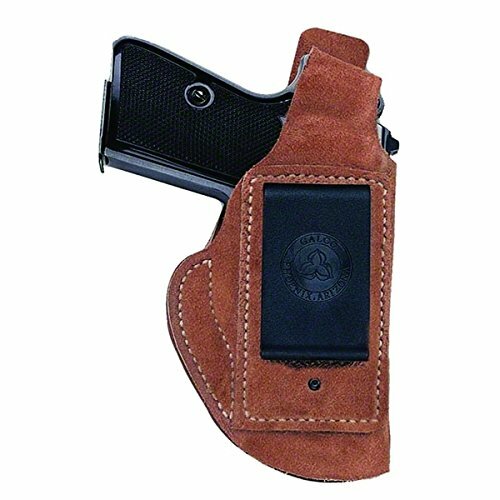 By contrary, the holster ensures great concealment and amazing adjustability. You may in fact set the can from 0 to 15 degrees, just the way you need it in a specific situation. 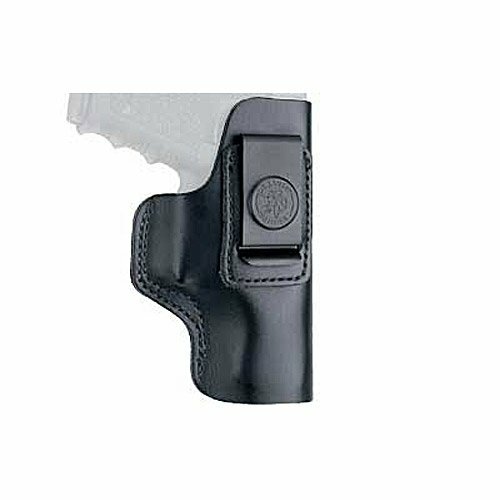 The retention is also adjustable and the positive retention SNAP ensures you that your gun is secure when holstered. The holster doesn’t dig into your body as the extra material between the muzzle and retention screw is removed, increasing your comfort. The trigger guard is undercut for higher grip and magazine release whereas your gun is holstered. The holster features a matter edge finish which makes it not only look nice, but also pretty durable. 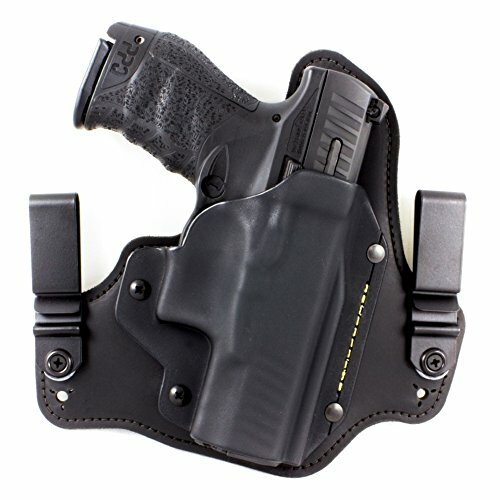 The holster is form-fitted and gives a snug fit with low draw. 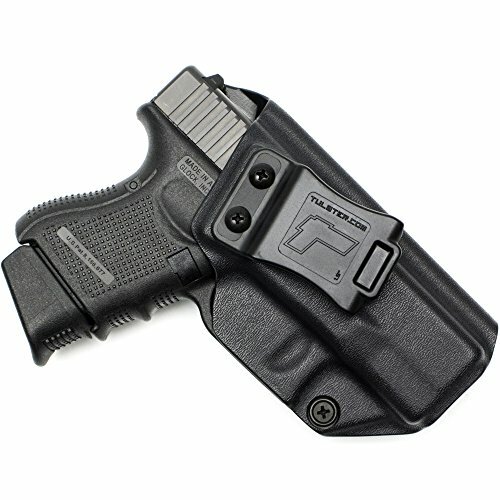 The injection molded belt clip and the soft loop option increase the versatility of the holster and sustain its value. Your gun is protected against corrosive perspiration thanks to the full sweat shield. The nice finish and the good built make the holster a great investment of your money any time. If you think you are willing to pay the extra buck for your IWB holster, don’t hesitate to give this one a go. When wearing an IWB holster isn’t just for regular use, get the real deal with a holster like the Galco KingTuk 2 Tuckable Inside the Waistband Holster. The holster may remind you the very popular, patented King Tuk and the holster is in fact a “brother” of the popular one. 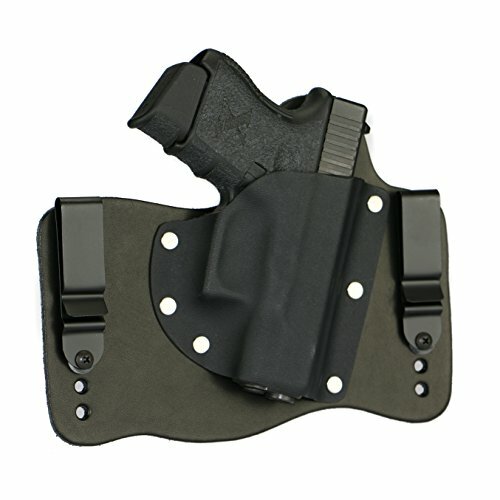 What sets this one apart is the hybrid design that gives a comfortable backing plate and a holster pocket. 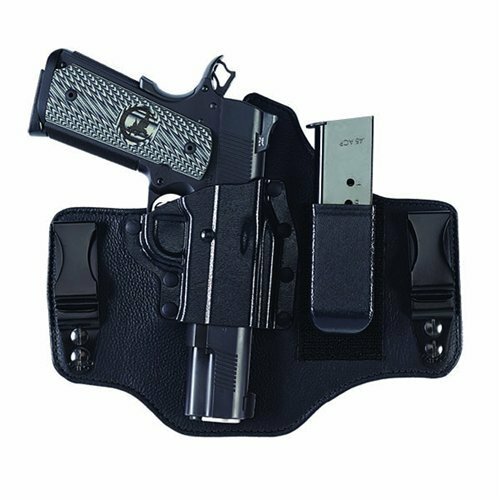 It the backing plate is made of lined saddle leather with Napa leather, the pocket is made of rugged Kydex that ensures quick draw and easy holstering. The KingTuk 2 also include a magazine carrier that is fully adjustable and easy to attach to a Hook&Loop pad. Your pistol and your spare ammunition are always together and at reach. The list of features continues with the removable metal belt clips that fit belts up to 1 ¾”. You may actually mover up or down the clips depending on the holes in the leather. This way you get to set the carry height and the cant, just the way you need it at a specific moment. Let’s not forget about the interchangeable injection molded nylon C-hooks that give the holster a low profile on the belt. The concealability is great and the holster is made to last. Despite the minor drawbacks, when in need for a tough, long lasting holster that holds up to your challenging duties, this one is a sure buy.